Beauty boxes are indeed other's envy and owner's pride. I take too much of pride or rather say joy in my monthly beauty subscription boxes. My Envy box or MEB is the one. Unboxing your monthly beauty subscription box every month is an altogether a different joy. I am super curious to know the theme every month and see what is packed inside, and then try what appeals most. Talking about luxury beauty subscription boxes, if there is one name that stands tall in India, it is MEB box. And this month is the first in the New Year, the box ought to be special. So when I received an SMS from the courier company stating the probable delivery of the box a little ahead than usual time, I was way excited. Normally, I received my MEB post 17th or so but this month it came a little early and that was so delightful. I canceled my outing and waited for the box. As the bell rang, I know it has to this and quickly slipped to pick it up and shoot. Before I could say light, camera, action, I needed to step out for some work. And could shoot only in the night. I finished shooting by 1:00 am, edited till 2:30 and then finally uploaded on my YouTube Channel. 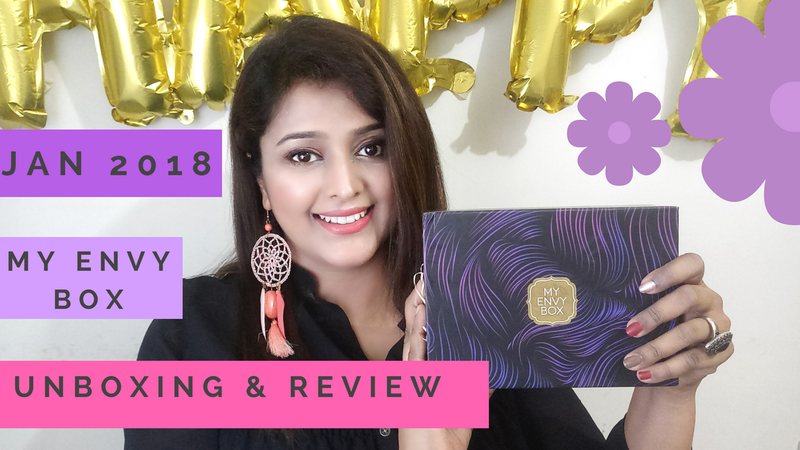 Do watch my video here to know what all have I received in my January 2018 MEB including the shades and my overall view. And yes, do not forget to subscribe to my channel. It is free you know! If you liked my video, do Subscribe My YouTube Channel. Your small efforts whether in form of views, likes and comments will encourage me to make better videos. I wanted to have a quick word on the box's design. I loved the Ultra-Violet color/pattern in the design. If you are aware, Ultra-Violet is the Pantone color of the year, and am so glad that it is the same color for this month's box. Co-incidence or brand strategy, whatever it is, it is pleasing. Thankfully the box and the products inside came intact. The MRP of this box is Rs 850 and you can check some interesting BOGO [Buy One Get One Free] or Buy 2 Box at low-cost offers from their website. 1) Am absolutely crushing on the four different nail paints from Bella Voste Brand. They have a good color, fast to dry and nice finish. You can check the swatches etc on my Video. Another reason for you to watch my video. 2) The Elixir Hair Fall Control Serum sounds interesting and I have tried it twice. Do let me know if you want a detailed review of the sort.